Given how astonishing China’s story over the past twenty-five years has been, and the implications that story would seem to have for both China and the rest of the world, it’s perhaps slightly surprising that there is relatively little sf that deals with that country’s future in any depth. On of the best-known examples, of course, is Maureen F. McHugh’s generous China Mountain Zhang (1992), set in a twenty-second century in which Communist China is the dominant superpower. 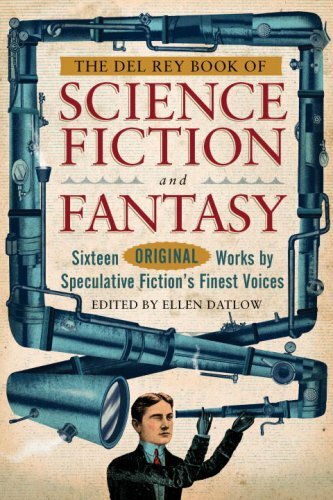 But the future looks different now than it did then, so I had a certain amount of expectation for McHugh’s “Special Economics”, published in The Del Rey Book of Science Fiction and Fantasy earlier this year. Also set in China, but rather closer to now, the story’s major speculative conceit is that a quarter of a billion people have been killed by a bird flu plague. Against that background, it tells the story of 19-year-old Jieling, who has moved from her home in Northern China to Shenzen in the South in search of a job. My expectations were more or less met: it’s a good story, perhaps a little undercut by the ease with which Jieling manages to do the sf-protagonist thing of pulling the levers of the world, but good nonetheless. One of the things that’s good about it, I think, is the deftness of its construction, which allows Jieling’s life to quietly illuminate her country. 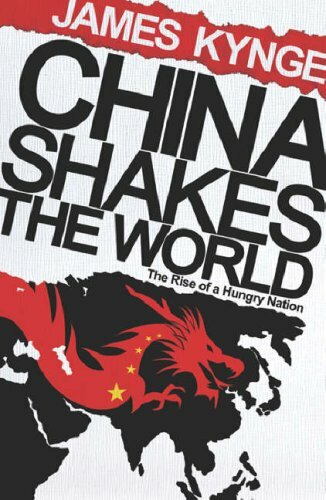 In that sense, plague notwithstanding, Jieling could almost have walked out of the country drawn in James Kynge’s 2006 book, China Shakes the World: the Rise of a Hungry Nation. Kynge, who spent over two decades as a journalist in Asia for Reuters and the Financial Times, is interested in the past two or three decades, the forces that during that time have driven China’s economic and political rise, how China relates to the rest of the world, and how that may change in the near-ish future. In China Shakes the World, a broad range of facts and figures — as you’d expect, staggering comparisons are commonplace, such as the fact that between 1998 and 2004 Chongqing grew by more than the size of two Birminghams, eight times faster than Chicago’s nineteenth-century peak of growth — are orchestrated into a series of narratives, case studies that illustrate particular aspects of his argument. Some are set in China — the story of Liu Chuanzhu, founder of Legend computers and recent purchaser of IBM, is one compelling example. Jieling could be one of these: another one of China’s millions of poorly-treated, economically essential internal migrants. Some of the case studies, meanwhile, range as widely as a UK private school, a small town in Ohio, or a textile town in Italy (the sort of migrant factory seen in the recent, and superlative, film Gomorrah); perhaps most striking is the book’s opening chapter, which describes the infamous wholesale relocation of a steel plant from the Ruhr to China. But it’s the movement between the specific and the general that gives the book its distinctive and welcome fluidity. Broadly speaking, the first half of China Shakes the World is concerned with establishing the narrative of the past; the second, with speculating about the narrative of the future. Kynge argues that China’s recent development is actually something historically new. This he puts down not just to the sheer speed of the transformation, what he describes as “the compression of developmental time” that puts skyscrapers next to huts, though that is of course daunting. It’s China’s most obvious characteristic — its size — which is, for Kynge, ultimately telling. Crucially, it enables China to simultaneously possess the characteristics of multiple countries: it has a vast workforce prepared to work for preindustrial wages and yet it also has a highly educated workforce skilled with modern technology; the result is immense productivity, but also, per the book’s subtitle, powerful hunger. Kynge’s argument that “Chinese history is very much less the story of multiplication than of long division” (48) rings true, with a tension between the number of mouths and the amount of food available to feed them having been replaced by a related-but-different tension between the number of people, and the number of jobs available to occupy them. One of the reasons Kynge’s choice of case studies ranges so wide is to demonstrate how that hunger can reach out around the world. Kynge also describes the shape of China’s economy, and its inherently unstable aspects. Although it’s no longer accurate to describe the economy as “communist”, government policies have the effect of ensuring that almost all manufactured products are in chronic oversupply, with the result that where other nations’ companies export to expand their success, China’s companies export simply to stay afloat. One of Kynge’s contacts in China explains that the central principle of the Chinese economy is that, “when reform is too fast there is chaos. When reform is too slow there is stagnation” (178) – i.e. that although the power and legitimacy of the Communist Party springs from continued growth and total control, maintaining both is nigh-impossible; one must be sacrificed to achieve the other. The extent to which China’s internal development has been unplanned was also new to me: in Kynge’s analysis, Deng Xiaoping is notable as much for being disobeyed as for being an architect of economic reform; he gave local governments and businesses an inch, and they took a mile, which has ultimately led to the promise we’re now confronted with nearly every week, of China’s economic dominance in the century to come. But it may not happen. Kynge gives four reasons why. The first is the environment. Kynge describes conservation as a “blind spot” for Chinese authorities, pointing to systemic failures of policy which cause immense damage, and suggests that if China’s “Green GDP” – the cost of dealing with the damage that has been done – is factored into estimates then growth has actually been more or less flat over the period of China’s miracle, rather than at 10% or more. Second, there is endemic corruption throughout the Chinese state; Kynge argues that most analyses of China’s economic potential do not take account of its underground economy, not just in its direct monetary value — which may be up to a third of the value of the mainstream economy — but in the effect it has on the value of China’s brand. He cites numerous examples of Chinese companies increasing their value by acquiring Western brands (such as Liu Chuanzhu’s takeover of IBM), rather than by exporting their own brands. Third, Kynge suggests that the “overriding contradiction” of China is simply that a communist state cannot manage a capitalist economy appropriately, leading to accumulating hidden costs, primarily in the form of bad debts and deferred insolvencies. And finally, he points to the consequences of the rest of the world’s attitude to China in recent years, speculating that Western hunger for access to Chinese markets may not, in fact, be limitless, and that Western societies could descend into resentful protectionism (because the benefits that trade with China brings are less visible than the job losses it causes). We may, in other words, yet prevent China from rising. There is, of course, the obligatory suggestion that now, when this book is being written and published, is the crucial moment (Kynge actually pinpoints the Rubicon-crossing in 2004), about which I am sceptical; but in general this is an engaging, thoughtful analysis. As I said earlier, Jieling’s narrative has the sort of solidity found in Kynge’s case studies, and many of the factors shaping her life are factors he describes; the plague has perhaps intensified some, but it has not been transformative. In the intervention of a somewhat hapless government agent towards the end of the story, for example, “Special Economics” gestures towards the idea that Beijing’s power is ebbing, that a communist government inevitably cannot fully control a capitalist state. Moreover, although Jieling finds a job with relative ease, despite her migrant status – she is hired by a biotech company to do basic work that is “pleasantly scientific without being very difficult” (150), and serves as both macguffin and metaphor — there is a nasty catch, which is that employees at New Life (the ironically-named company) sign away their basic rights and become slaves. Among other things, living expenses, food, and uniforms are all deducted from their wages – and there are further performance-related deductions. One of the driving forces behind this is a desperate need for New Life to remain competitive in foreign markets; but the human result is that Jieling is heavily in debt by the time she receives her first pay cheque. Faced with near-impossible odds of ever paying off their rapidly accruing debt, some of Jieling’s colleagues have surrendered themselves to the company – after all, they reason, it’s not such a bad life – but Jieling, with Heinleinian resourcefulness, of course Finds A Way to pay off her debt, by dancing in the “plague-trash markets” where the possessions of bird flu victims are sold on. None of this is to disown the story’s more straightforward humanity; just to say it is not the only thing that drives it. I could provide a similar analysis of UFO in Her Eyes, despite its garish-seeming title. 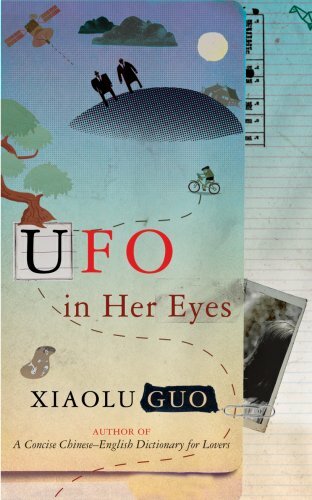 The starting point for Xiaolu Guo’s fourth novel to be published in English is an event that took place in Silver Hill village on the twentieth day of the seventh moon of 2012 (as the local calendar has it). Standing in a rice field, a friendless, unmarried peasant woman named Kwok Yun saw a big silver plate in the sky, heard a strange noise, and felt a force from above tugging at her. When the moment passed, she found a foreigner – a Westerner – lying nearby, sunburned and with a wound in his leg. For fear of damaging relations between China and other nations if she does nothing, with the help of some children she takes him to her home and dresses the wound, then goes to collect some healing herbs. When she returns, however, he has vanished. After some thought, Yun realises she needs to report the incident to Chang Lee, the village chief (unfazed by, and in all honesty not entirely understanding of, the potential for first contact; she is more concerned with where dinner is coming from). Chang passes the news on up the chain; and in September, two government agents arrive in Silver Hill to investigate. And Silver Hill is an emblematic place indeed. It is located, as several villagers proudly note, less than fifteen kilometres from the birthplace of Chairman Mao; as a result it was gifted with generous amounts of farm equipment — eight tractors and ten manure spreaders. But that was fifty years ago, and since Mao’s death the village seems to have dropped off the government radar. “Once we were revolutionary and progressive,” Chief Chang notes, in a careless moment of honesty, “now we are slow and backward” (7). Every trend seems to be moving against the villagers. The young think that “any big city is better than Silver Hill” (17) and leave; the youngest person interviewed by the government agents is Yun, aged 37. (Jieling, we can imagine, came from a village like Silver Hill. For her, country is axiomatically bad and city is axiomatically good; her friend’s plans to go home and get married when she pays off her debt “seemed very country”) And each year, creeping desertification makes it harder for those who remain to draw a living from the land. No wonder the villagers constantly refer to their past; no wonder many of them cite an old proverb to the effect that people must be prepared to “eat bitterness”. I would be surprised if, on reading passages like this, I’m the only person reminded of Geoff Ryman’s Air (2004). That novel is not set in China, but Silver Hill and Kizuldah are the same kind of place, and Chief Chang seems cut from the same cloth as Ryman’s Chung Mae – a middle-aged woman determined to pull her village up by its bootstraps. Subsequent to the speech above, we find that as a result of Chang’s lobbying the government has awarded two million yuan to Silver Hill to make it “one of China’s ‘up to speed’ villages”, to which end a Five Year Plan has been prepared which entails investment in such things as infrastructure, a “future technology hub”, service industries, entertainment provision, and housing – and developing tourism as the village’s major growth industry, based on Yun’s “significant contribution to science” (108). The next batch of reports are transcripts of interviews carried out by Hunan Finance Officer 8 (again, no name) to document the villagers’ reactions to this incipient economic miracle, which are about as mixed as you might expect. If Guo’s novel also has a certain amount of stylistic similarity to Ryman’s – in prose that aspires to a sort of unjudgemental innocence about its characters, in its portrayal of a living small community, in its themes of the impact of globalisation and development – it is, ultimately, rather different in temperament. Air is not uncritically optimistic, but it is, at heart, optimistic – luminously so; it is one of the book’s virtues – and, particularly in its later stages, evinces a fable-like conviction in the story being told. UFO In Her Eyes, by contrast, is a far more sceptical work. The urbanisation of Silver Hill (the characters describe it as modernisation) becomes a goal unto itself, a pursuit of something they should be whether or not it’s something they want to be, and irrespective of its worth to the village’s inhabitants. In many cases, that worth is “not much” – there are interviews with the fisherman whose pond will be destroyed, the rice farmer whose field will be replaced with a UFO memorial and restaurant, the noodle seller whose stall will be forced out of business. These are men who know no other life, who in some cases are unable to live any other life – who struggle with the transition from their “proper peasant calendar” to an “impossible city people’s Western thing” (35), who may be scarred by previous Chinese attempts at modernisation. Even when they can adapt, they may be prevented from doing so by bureaucracy or circumstance. Much is lost in the rush to progress. Of course, Silver Hill is not a unique creation. The speed and ferocity of China’s urban boom is well documented, as are the development policies which drive it, not least by books like Kynge’s. And in sfnal terms, UFO in Her Eyes is lower-key than any of the other works I’ve mentioned here, even “Special Economics”; even in the background of Guo’s story there are no grand events, and there’s certainly no innovation as transformative as Air. Yun’s sighting remains enigmatic to the end – the UFO is never seen again – and, at least at first glance, appears to be important more for its catalytic effect on the local economy than anything else. So there is an extent to which UFO in Her Eyes could be characterised as sf in trappings only. Seeking to portray the normal life of the future is one thing – an admirable thing – and understatement is appealing, but merely placing an existing normal life in the future could be said to lack a certain vigour. I think Guo is cannier than that, though. I don’t think it’s a stretch, in fact, to suggest that Yun’s t-shirt hangs a lantern on this very issue. To say that the book demands to be read as an exploration of that question – Is this the future? – might be taking it too far, and would in any case sound awfully ponderous for a book with as light a touch as Guo’s usually has, but the resonances that the book’s sfnal trappings raise are significant. There may or may not be any actual aliens in the story (I think there may in fact be one, hidden in the interstices of other people’s stories), but there is no shortage of alienation, from the nameless government officials, and Yun’s initial position as an outsider, to the connotations of foreigner-as-alien and how they reflect on Chang’s desire to get Silver Hill to engage with the outside world, and the silent but increasing number of deprived migrants who arrive in Silver Hill seeking the new jobs that development creates. There are moments of bureaucratic absurdity, and moments when the remote fumbles of government have all too real consequences. The society presented is one in which “peasant” is a political designation, where by habit much is censored, or simply not reported. (“Disaster belongs to the West” , Chang cynically notes, in another unguarded moment.) If this sounds like a lot of ground to cover in a slim book (it is only a shade over 200 pages) then, well, it is. Guo is not a writer who paints her panoramas with detail; rather, she suggests much with a few strokes of the pen, and provokes much in the reader. The bulk of UFO in Her Eyes has a documentary coolness and sweep, which is occasionally counterpointed by vivid close-ups. Much that is troubling hides behind the carefully correct official answers, through reference to the past or gesture to the future; along with just enough sweetness to make eating the bitterness bearable, even as the first smog clouds the sky above Silver Hill. Well, I haven’t read it, but since I am horrendously under-read in Le Guin anyway, I may pick it up and give it a go. Thanks.